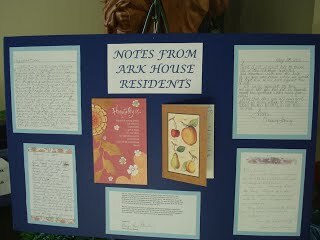 Here are words from former residents expressing how Ark House made a difference in their lives. "Thank you so much for all you have provided for my family while my husband was in the hospital. When we knew we had to come to Dallas, I was totally terrified. It was such a great blessing to have a neat, restful place to retreat to after long hours at the hospital. I was able to use my computer to work on several projects so that I could help the people I work for as well as keep my insurance in force. This was truly an answer to prayer. I know sometimes we think what we do is a hard, thankless job, but never realize the far-reaching effects on others. Thank you and God bless you in your special ministry here." "The Ark House was a miracle for me and my daughter. Amy had been in the hospital for 70 days when we came here. Amy was in a car wreck, she was in a coma for 21 days. She has a traumatic brain injury. Amy broke both of her legs, which now have rods in them. She also broke her jaw. My daughter learned how to think, walk, eat, talk and live normal at this Ark House. God has given us so much hope in our time of tragedy and it has truly been a joy staying here. Keep up the spirit of hope you bring to lives by offering a place for recovery." P.S. "I remember asking God to please show me the way and I will follow. God brought us here and we are so thankful." “I am terminally ill with bone marrow cancer. I have to travel hundreds of miles from a tiny, rural town in south Texas to be able to get treatment from my oncologist, and transfusions at Medical City. The Ark House church members can never be thanked enough for allowing me to stay here. Otherwise, I would be forced to sleep in the back of a van. "My son was burned over 60% of his body with 3rd and 4th degree burns. We did not know whether or not he would live for weeks. After 6 weeks of ICU and weeks in the Parkland Burn Center he did survive. He had 4 surgeries. After months of therapy here in Dallas we will be going home soon. I would not have been able to stay here had it not been for the good people of the Ark House, God and many prayers from all over Texas and many other states. Words cannot express our deepest appreciation to the support of the Ark House." In my heart I have thanked you many times, but I want to express to you how very much it means to me to be in your cozy apartment. At the end of a day dealing with the realities of my baby sister's brain tumor, I come home to the comfort of a home-away-from-home that you have thoughtfully provided with all the conveniences. This is more than shelter. It is an emotional support to one far from my home in North Carolina and all alone. One thing that I will take away form this experience is your example of real Christian love in action. I appreciate the phone calls from my shepherd (C.C.) who makes time in her busy life to check on me and visit. Thank you for the hard work and obvious caring and love that you have lavished on this project. It means so much." "Thank you so much for letting my Mom and Dad stay here for as long as they did. I really do not know how we all would have managed without a place like this. Thanks to all the volunteers that keep this place running. God bless all of you." V. R. & B. H.
"I learned in Girl Scouts that you should leave a place better then you found it. That would be hard to do at Ark House! Thank you for making us comfortable during the five weeks we had to be in Dallas at Medical City."